In an interview with Mr Denyys M. Odhiambo, a human rights officer and trainer with the Kenyan Prison Service, PRI asked about his experiences in providing training on the UN Bangkok Rules to his colleagues in Kenya. What is your role within the Kenya prison service? I am a human rights officer/trainer with the Kenyan Prison Service, stationed at the Shikusa Borstal Institution, which is a juvenile facility in western Kenya. My role involves training correctional officers on international human rights instruments relating to the administration of justice, i.e. the UN Standard Minimum Rules for the Treatment of Prisoners (Nelson Mandela Rules), the Bangkok Rules on women offenders and the Beijing Rules on juveniles deprived of their liberty. I carry out audits and assessments of prisons to ensure compliance with the rules, and I also provide advice, guidance and assistance to both staff and prisoners on human rights issues relating to the Bangkok and Mandela Rules. Why did you become interested in the UN Bangkok Rules and inspired to teach your colleagues in Kenya about them? I became interested in the UN Bangkok Rules because, as a human rights trainer I realised that as women are a vulnerable group with specific needs there was a need to train female officers on gender-specific rules. I felt that more training was needed on the handling of female prisoners, for example, to encourage professionalism and the use of good practice in corrections. I gained more insight and knowledge on the rules from participating in Bangkok Rules training for senior correctional staff provided by the Thailand Institute of Justice from 10 – 19 August 2016 in Bangkok, Thailand. I subsequently completed PRI’s e-course, Women in detention: Putting the Bangkok Rules into practice. I also have training skills that I acquired through training provided by the Kenya Prisons Service/Raoul Wallenberg Institute partnership in Kenya, and The International Human Rights Training Program in Canada. I would really encourage all correctional officials, especially those working in women’s prisons, to take the PRI e-course on putting the Bangkok Rules into practice. The particular needs and issues of women are not captured well in our local prison laws which are currently under review, to be brought into line with the international rules, including the Mandela Rules, the Bangkok Rules and the Havana Rules. This to me will be the greatest achievement for the Kenya Prisons Service towards embracing best correctional practices. What do you think is the most important change that has been brought about by the Bangkok Rules in Kenya? The Bangkok Rules recognise and emphasise that female prisoners have different needs. 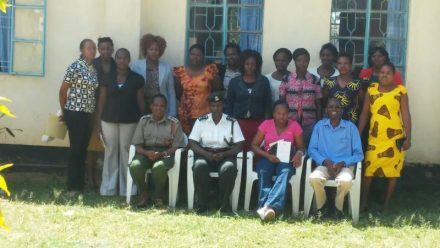 Training on the Rules means that officers now have much greater understanding of the different pathways to prison for women prisoners which are due to: their socio-economic status, drug and substance abuse, trauma, mental health issues, and histories of violence. I believe that an understanding of this (the different pathways to prison for women prisoners) has really changed officers’ attitudes and perspectives towards female prisoners, which to me is a great achievement since this will work towards increasing compliance with the Rules which is the ultimate goal. I believe that an understanding of the different pathways to prison for women prisoners has really changed officers’ attitudes and perspectives towards female prisoners, which to me is a great achievement. What has been your biggest challenge in providing training on the Bangkok Rules? The two biggest challenges I face in delivering training are time and resources. I am not able to conduct training for a full day because I am not in a position to provide refreshments and lunch for participants, so I can only run half day sessions. I believe that a full days training course is required both in order to cover all elements of the rules and ensure the participants have a full understanding of all the issues, but also because the training technique is participatory which requires and encourages collaboration, and a sharing of practical experience so that when you introduce concepts, participants feel that they own the process thus making adoption of the Rules much easier. The second challenge is the lack of resources available: I would like to be able to provide certificates to the participants, as well as copies of the Nelson Mandela Rules (since the Bangkok Rules supplement the Mandela Rules), but I do not have these. In addition, training aids such as flip charts, marker pens, writing booklets and pens etc. would be really useful to make the training visually interesting and more interactive. While I currently conduct training in the prison chapel, the participants feel that the training should be conducted outside the institutions they work in – in a neutral location such as a conference venue. However, this has not deterred me from conducting training, I work with the limited resources that are within my reach guided by a principle “low cost no cost”. What element, area or specific rule of the Bangkok Rules do you feel is most resisted by the colleagues that you have trained? In my experience, the section relating to ‘institutional personnel and training’ is most resisted, because officers sometimes feel that the training and the Rules concentrate solely on the prisoners’ welfare and that their own welfare is overlooked. Staff often feel that my role as a human rights officer should include advocacy for improvements in staff welfare in areas such as housing, remuneration and working conditions. What problems do you see Kenya facing in implementing the Bangkok Rules? I do not see any major problem in Kenya implementing the rules, but the training given to officers at the Prisons Staff Training College needs to be updated to fully integrate the Nelson Mandela Rules and the Bangkok Rules in order that all training given to officers is consistent and in line with international standards. It is important that the Bangkok Rules do not appear to be an international law being enforced within our system from outside. Once the reviewed Prison Act is adopted, it will be much easier to implement the rules, which will encourage good correctional practices and enhance professionalism in our correctional facilities. What are the positive changes that you have seen following your training of others on the Bangkok Rules? These are both really important changes as they help to ensure that family relationships are maintained. Why are you motivated to continue training on women prisoners? I am motivated because I strongly believe that training enhances the professionalism of the officers and it will lead to good correctional practices being implemented. The humane treatment of female prisoners assists with their rehabilitation and their smooth reintegration into society. Your comment. Bravo Denyys. Sure all the undertakings of your training’s was not in vain. We are proud of u as HROs, and we are in it to bring change in our correctional centres. Edith- Nyeri. Mr Denyys M. Odhiambo is a human rights officer and trainer with the Kenyan Prison Service. This free online course combines analysis of the Rules, interactive assessments and application of the Rules to real life situations.